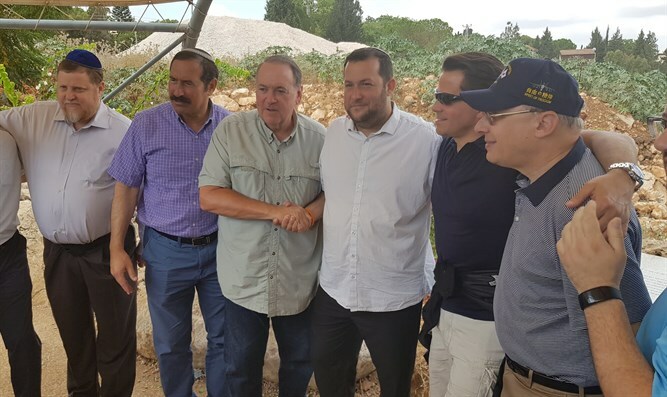 Mike Huckabee, Anthony Scaramucci, visit Samaria, emphasize that current US administration isn't about to uproot Jewish communities. 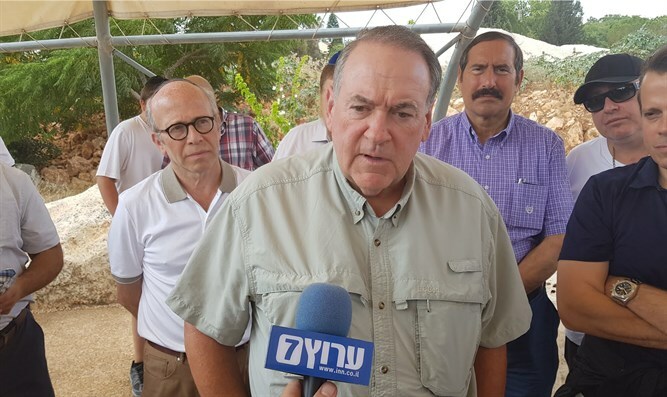 Former Arkansas Governor Mike Huckabee and Former White House Communications Director Anthony Scaramucci on Monday visited Samaria together with Arutz Sheva and Dr. Joseph Frager. The trip was organized by Dr. Frager. Welcoming the group, Samaria Regional Council Head Yossi Dagan said, "I know that we can, together, work hard to keep Judea and Samaria safety (sic), and I'm sure that this is historical days. We can make a change." Huckabee said, "Judea and Samaria - this is land that the title deed goes back over 3,000 years. It's absurd for anyone - whether they're in the United States or any parts f the world - to talk about this as if it's occupied. It is occupied, it's occupied by the people who have owned it, and legitimately and ancestrally, and ingenuously owned it for the 3,000 years since the title deed was given by Abraham." When asked whether he believes the current US administration will force Israel to evict Jews from their homes, Huckabee responded, "I pray to G-d we don't because that would be the most disruptive and destructive thing that could happen." He added, "In the past when land was given up...for peace, there was no peace, things got worse. Gush Katif is a terrific example of what happens when Israelis desert their rightful places and give over, thinking that it will bring peace. Look at what happens in Gaza now." Huckabee also noted that the Boycott, Divestment, and Sanctions (BDS) movement harms Palestinian Authority (PA) Arabs more than it harms Israelis. "When people say that the BDS movement will punish Israel and it will help the Palestinians, that's nonsense," he said. "The people that it hurts the most are the very Arab Palestinian people who have jobs that will pay them four times what they will ever make in the PA.... It gives them a chance at upward mobility. Where they're stuck now in the PA, their only future is abject poverty." "The money that the PA gets, they steal and they take it in a corrupt government, using it for a handful of high officials, and for the rest of it they use ti to fund bombs and bullets and terrorism. They're not building streets and sewers and schools. And that's why the whole BDS movement needs to be called out, not only because it's hurtful to Israel, because it's even in a greater way hurtful to the people they think they're helping, and they're not. It should be noted that the Samaria Regional Council works extensively to fight the BDS boycott. Among other things, the Council is working on a joint project with the Ministry of Strategic Affairs, led by Public Security Minister Gilad Erdan (Likud). 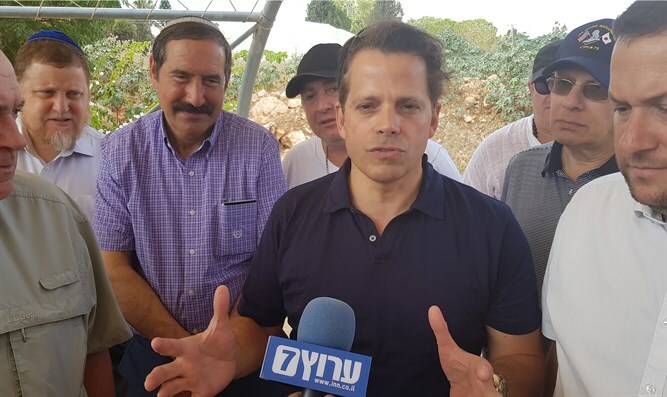 Regarding uprooting Jewish communities and freezing construction in Judea and Samaria, Scaramucci said, "I don't even think that's on the table anymore." He also emphasized his belief that support of Israel should not be connected to US politics. "What I would like to see, over the next ten or twenty years, is a lack of partisanship as it relates to our alliance with Israel," Scaramucci said. "Our love and support should not be a left or right issue, it should be that we stand together as democracies, we stand together in the western cannon of individual liberty and protection, and that's for all people that want that same prosperity, that same life."